We inventory all sizes of low slope / flat commercial roofing screws, stress plates and accessories for mechanically fastening TPO, PVC, EPDM or SBS to metal, wood or lightweight concrete substrates. Our fasteners are FM and Metro Dade/ Dade County approved. They are made by the industries leading manufacturers and have the best warranties. Screws List: We have roofing screws in every length for all applications including 12 gauge, 12 gauge hex head, 14 gauge, 15 gauge, K-Fast Flathead and belted fasterners. See our Full Product Catalog and Selection Helper for help. Also we have screws & plates for lightweight concrete, Purlin fasteners/plates and concrete screws. Stress Plates: We have stress plates for all types of requirements: membrane plates, insulation board plates, belted plates, pre-assembled plates, seam plates, Tectum plates, lightweight concrete plates and more. All shapes: Hex, Round, Oval and Square shapes. Termination Bar and Batten Bar: All types and grades for every application. Cross Reference Part Number Tables: Mfg. Spec's, Screw Part #, Plates, Termination Bar and Batten Bar. We'll drop ship your order anywhere. Call us for our special pallet quantity pricing. Commercial / low-slope roofing screws and plates are all made similarly. Most roofing fabric suppliers purchase screws and plates from companies like SFS, OMG or Trufast and have them private labeled. We have a handy cross reference table for both the parts and specifications. Our products meet all cross-reference specifications Here is a good guide to Low Slope Commercial Roofing Screw/Plate Selection. 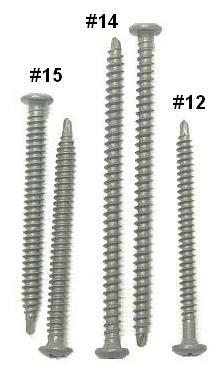 Roofing Screw Design: There are two head designs (truss and HWH) and several wire sizes available (12, 14, 15 and 21). Finishes are all high-performance polymers, or stainless steel screws are available. Roof Stress Plate Design: Smaller plates, 2 to 2-1/2 inches are for membrane and seams. Larger plates, 2-3/4 to 3" are for insulation board. Plates are design to fit the roofing screw wire size (12, 14, 15 or 21 gauge), and the head design (truss / Phillips head and hex-washer head. The HWH screws are taller and need special HWH recessed plates to match. Plastic plates are also available, as well as stainless steel plates. 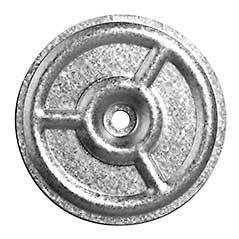 Seam Plates: These 2-3/8" barbed galvalume plates used for the mechanical attachment of TPO or other reinforced membranes to 22-gauge steel, wood or structural concrete decks, generally using a #14 All-Purpose Fasteners. Batten Bar Design: Batten Bar is used to secure single-ply membrane to Gypsum, Tectum and Lightweight Concrete Decks. Batten bar is 1" wide and available in galvalume coated 18 gauge steel, or 40-50 mil polymer. 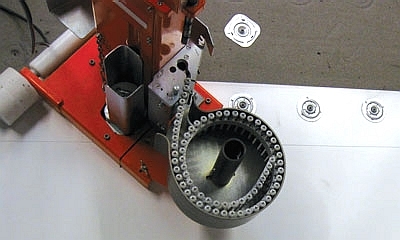 Countersunk holes are punched with a standard spacing of 3 to 6". Polymer bar is packaging in 250 foot coils with non-countersunk holes.